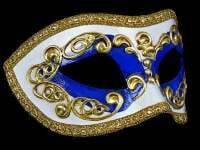 A party mask with Silver swirls on a gold / purple hand painted base with gold braid edged detailing. Essential for refreshing your spring/summer party wardrobe, this Decor Era party mask is effortlessly elegant and the ultimate in fashion. Designed with Silver swirls on a gold / purple hand painted base & features a delicate gold braid edged detailing. 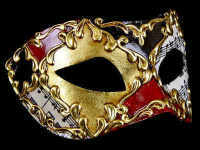 Take your look to the next level with this beautiful masquerade mask for both men & women. 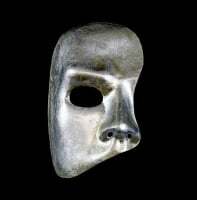 With soft black satin ties this mask is perfect for your next masquerade party, wedding, prom night or Venetian masked ball.